It's on the tip of everyone's tongue. I just gave it a name. I've been challenging people to talk about 9/11 Truth via my blog. I wanted to encourage others to do the same: write a blog post to someone waking them up to 9/11 Truth (just be sure to link to them in your post and click on the link a few times so you show up in their site stats). A personalized message can be very effective in waking people up, and more importantly, getting them to join us. 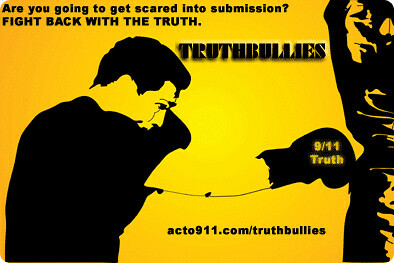 If you don't have a blog, or even if you do, you can write letters to bloggers to wake them up on the Truth Bullies web site. Ali aka Danish points out a novel form of getting messages out: balloon blogging. Check out this short video to get the basic idea. The 9/11 truth movement could release 9/11 statements tied to helium balloons in crowded outdoor and indoor areas to get people's attention.